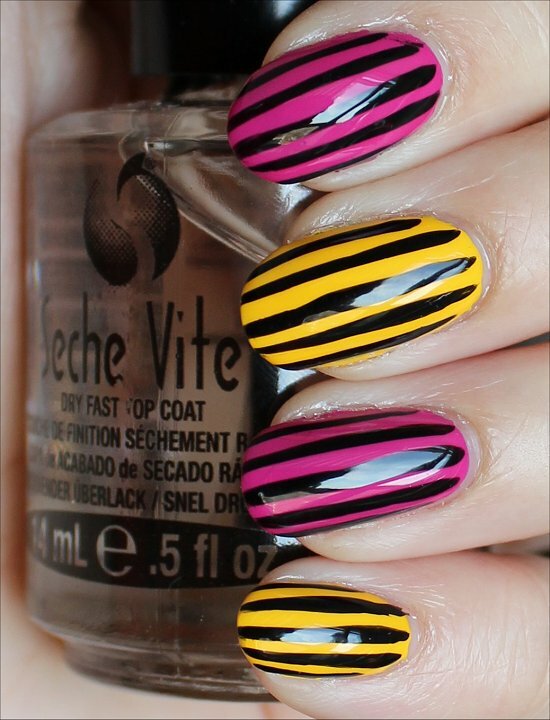 Do you ever have the itch to do nail art, but you can’t think of a design? It happened to me a couple of days ago. 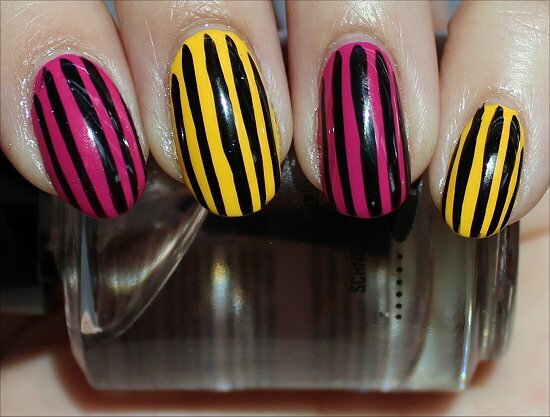 I didn’t want to do something intricate due to time constraints, and I wasn’t up for dealing with the messiness of nail stamping. 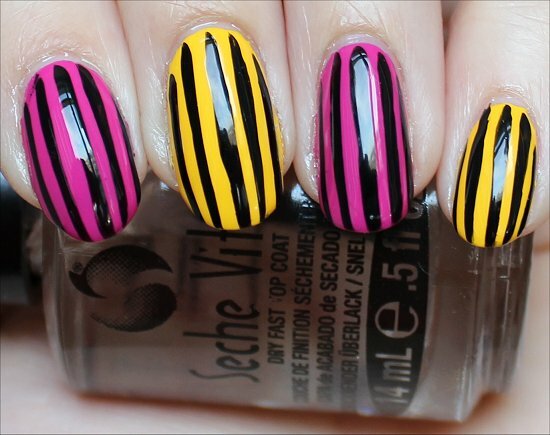 These Vertical Stripe Nails helped satisfy the craving for nail art without taking up much time or concentration. 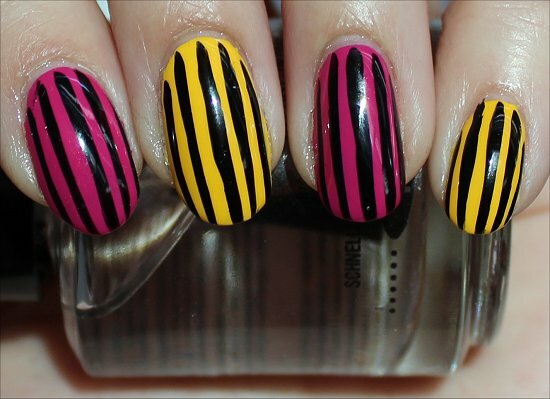 Ever since doing Jack Skellington nail art, I knew that I’d have to do a manicure with vertical stripes on all the nails because I think it’s a really fun look. 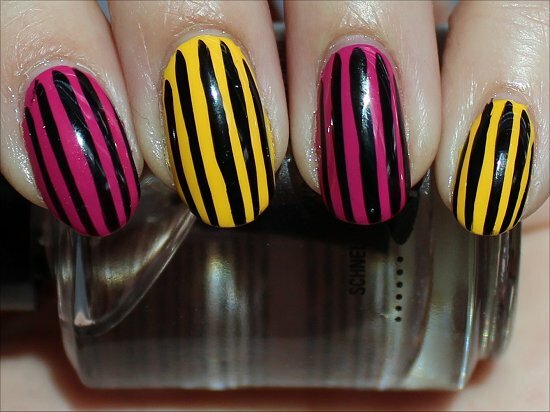 Here I used two shades from the Nicole by OPI Selena Gomez Collection coming out in January 2013 – Hit the Lights (yellow) and Spring Break (pink). 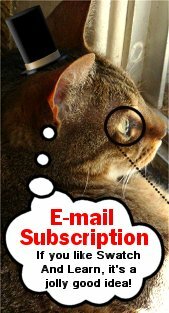 I didn’t bother doing a step-by-step tutorial for this because it’s very intuitive. 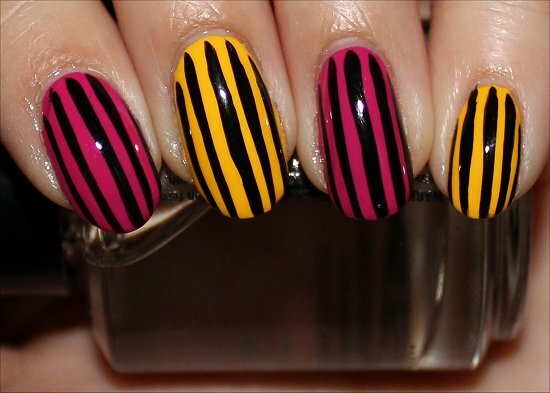 Just paint your nails with alternating colours. 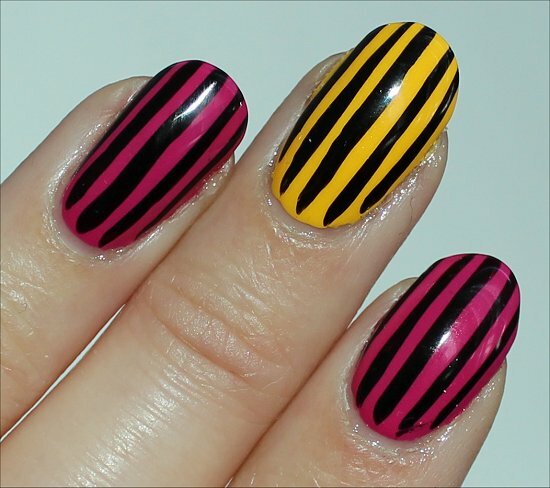 Wait a few minutes before painting the black stripes, so you don’t end up dragging the base polish. 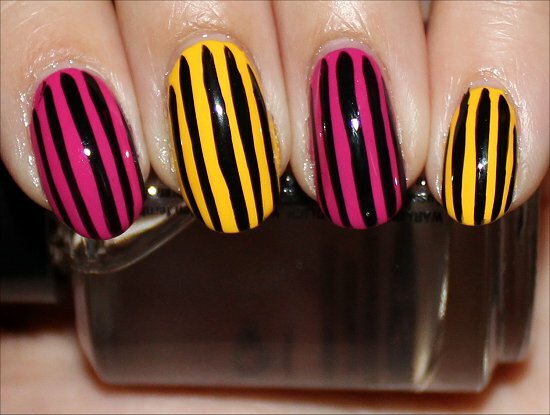 Would you wear vertical stripes on your nails? 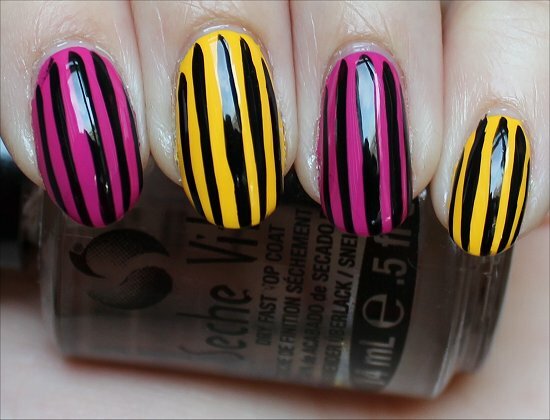 What nail-art design do you tend to do when you don’t have time for something intricate? This entry was posted in Nail Art, Nail Polish Swatches & Reviews, Product Reviews and tagged Milani, Nicole by OPI on November 19, 2012 by Mary S.. 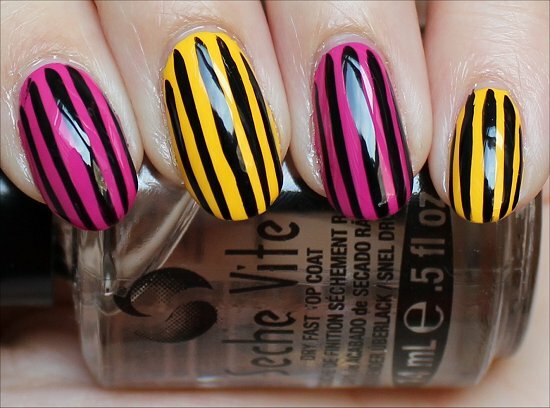 It could also be cool to go with a black-ish background and rainbow stripes! 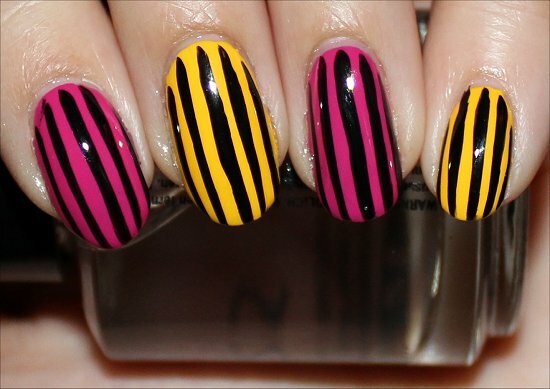 It would also be neat to do all different rainbow colours as the base shades with black or white stripes. Hmm! Hope someone will try it and share photos with me. 🙂 I’d love to see how it turns out. This looks really cool!!! I know exactly what you mean about not knowing what to do. It happens to me way too often. I usually go to Pinterest for inspiration when that happens. Hehe, ohhhh Pinterest! I could spend hours there. 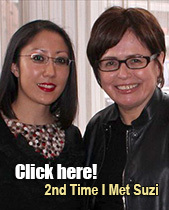 Times really flies on that site! And there are so many yummy food photos, too! My favourite are the DIY pins. This looks so awesome, Mary! I really love the yellow base colour, I can’t wait for the Selena collection to come out! YAY! 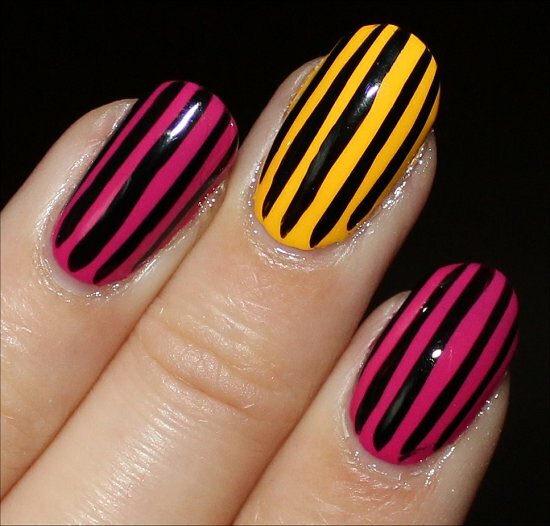 Please share the photo of your manicure if you give it a go. I’ve love to see what colours you used and how it turns out. 🙂 You’ll love wearing the look!